I am back at Colorado University, Boulder, and no longer jet-legged, after participating in the first half of ATom. 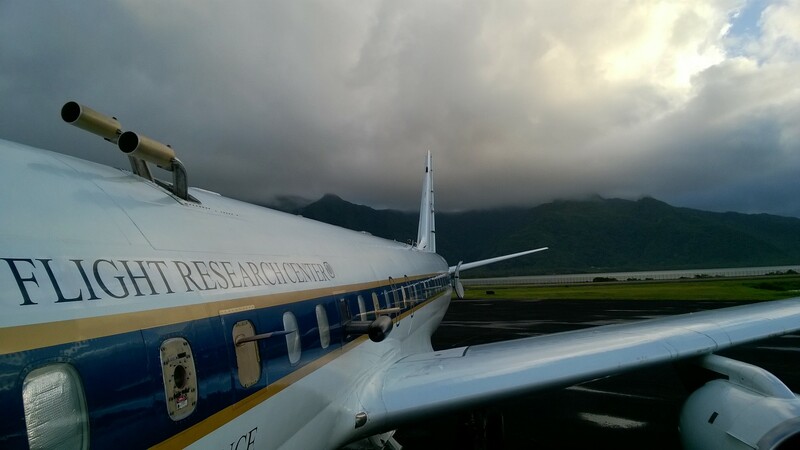 After the Hawaii post, the NASA DC-8 traveled to America Samoa in order to sample the difference between northern and southern hemispheric background pollution and transport. We did observe a decrease in the amount of pollution crossing into the southern hemisphere. NASA DC-8 in America Samoa prior to take-off to New Zealand. 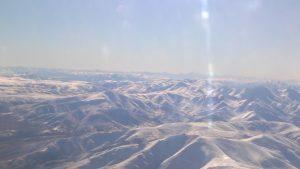 However, the largest decrease in background pollution was not observed until we traveled further south to New Zealand, which was the next stop for the mission. The large decrease in background pollution stems from two reasons: (1) at the latitudes of we traversed between America Samoa and New Zealand, there is not much land mass and large population centers that emits large quantities of pollution, which is the opposite of the northern hemisphere; and (2) at these latitudes, it is still winter time, which means slower chemistry and production of important background pollution like aerosols and ozone. DC-8 flying over southern island of New Zealand. Further proof that it is winter in southern hemisphere. New Zealand was the half-way point for the mission, where many scientists swapped for the second half of the mission. I swapped with another post-doctoral researcher from my group while one of the staff scientists remained to finish the mission. At this point, the DC-8 is at the Azores, after flying from New Zealand to Punta Arenas, which provided the scientists an opportunity to fully sample southern hemispheric winter chemistry and pollution (many reports from the scientists of the lowest amount of pollution they have ever seen). After Punta Arenas, the DC-8 went to Ascension Island, (an island I never heard of but is in central Atlantic), which provided the scientist an excellent opportunity to measure the transport of biomass burning (think forest fires) from Africa, and after Ascension, the scientists went to the Azores. After this stop, the NASA DC-8 has two more stops (Greenland and Minnesota) prior to arriving back at home base of Palmdale, California. This is my last blog post about ATom and being out in the field. I am hoping to be participating in ATom-2, which is this upcoming January and February. If I am, I will be updating what is going on through this blog.